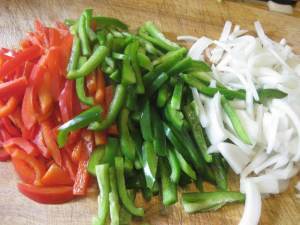 Slice into thin strips the peppers and onions. Pour a glug of olive oil into your skillet, add the onion, and let it cook slowly until soft but not browned, about 5 minutes. 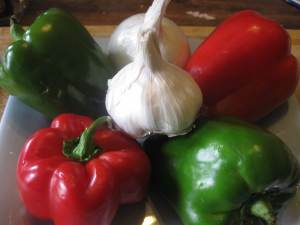 Then add peppers, garlic and herbs. Saute until the peppers are tender-crisp, about 5 minutes. To freeze piperade, let the mixture come to room temperature. Then pour into zip lock bags or sturdy plastic tubs, and freeze for up to one year. Because I am a family of 2, I freeze mine in double-serving sizes. Isn't it amazing how such simple ingredients, like the piperade you describe, can add a flair of sophistication to just about anything? 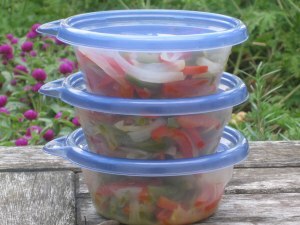 This is a great way to preserve fresh peppers from the garden. Thanks for posting the recipe! Cooking Good – welcome to A Garden for the House! This post is a revelation – I never thought to make this is a large batch and freeze it! I think I need to go through your archives and virtually pillage your brain for inspiration! Donna B. – Julia Child once commented that the only way to avoid garlic breath is to make everyone is eating it. I concur. As for the archives…pillage away! I am soooo glad I was persisitant! The first link I found to this article and recipe gave the me the old “this page cannot be found” message, so I went down the list of archived articles and found it under a different name! So glad, every time I have tried to freeze onions or peppers, I did them fresh and the results were not pleasant. Ugh! I had a bumper crop last year and still have many in the freezer that I haven’t used because of the taste. Not sure what I’ll do with them but I am sure what I will do with the ones (God willing) I grow this year! Thanks Kevin. Judy – When A Garden for the House migrated from google blogger to WordPress, every single link became broken. Although I’ve fixed hundreds of links, I still have 1000 more to do! So I’m glad you found this piece. 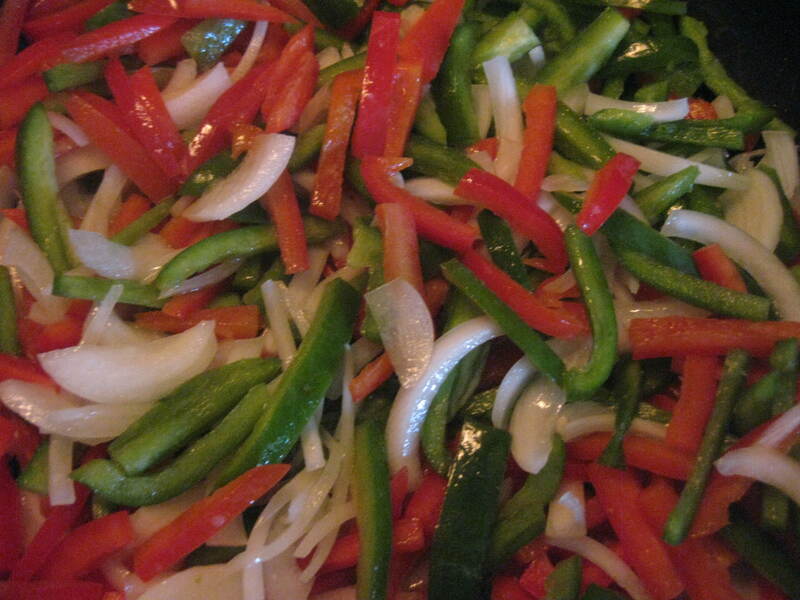 Anyway, cooking onions and peppers together as Piperade is the very best way to preserve these veggies. And what a convenience to have on hand. Lately I’ve been making vegetarian pizza, by simply spreading homemade tomato sauce on the dough, then topping with Piperade and cheese. It’s not only delicious to eat, but pretty to look at. A simple omelet becomes a masterpiece when topped with Piperade, as does a plate of pasta. Piperade does wonders for a sauteed chicken breast, too! Well, I’m going to make this when my bell peppers turn orange, red and yellow! I use these same ingredients all the time in cooking. Great idea to have them all ready. Thank you. And i agree with Donna B. Lots more garlic! Fortunately, my true love loves garlic too. This is a great idea, but since I’m short on freezer space, I’d like to know if it can be canned. Hi Denise – I can’t honestly say if Piperade is suitable for canning. I always freeze it. And it is the first thing I run out of! I recently sauteed and froze fresh mushrooms. Can I assume you could add these to the Piperade? Wow…this is good to know. Very handy at any time and a good idea to keep bell pepper from rotting. Thank you! This is a good idea. Now I know what to do to save my peppers. Thanks Kevin…Enjoy your colum.